This report recapitulates the discussions held on Tuesday, July 18th, 2017. The program, participants, and scientific presentations are available on the webpage of the meeting. Provide a joint distribution of tools for computational systems biology, developed by CoLoMoTo members and others, using Docker image(s). Provide (and advertise) an interface to write and document model analysis workflows, which typically rely on several tools, using the Jupyter notebook web interface. We also discussed teaching aspects, and potential publications. Docker is used in many cloud environments, including data science and bioinformatics, to promote accessible and reproducible software (see for instance the BioContainers project). Docker provides a container system, which makes easy to provide complete environments for running executables. On Linux, it does not require any virtualisation, hence have no performance drop. On Mac OSX and Windows, it can exploit latest virtualisation technologies embedded in processors to minimise the overhead. Once the docker system is installed on the machine, installing and running a docker image can be done with a single command. Our objective is to provide a docker image including the main software tools for manipulating and analysing logical models of biological networks. It may include, for instance, BioLQM, EpiLog, GINsim, clingo, MaBoSS, NuSMV, Pint, Boolsim, Node.JS, bns, Boolnet, espresso, etc. The docker image will also provide an interactive web interface to write and document model analysis workflows, for example using the Jupyter notebook. A github project for building the Docker image has been created by Loïc, Aurélien, Céline and Pedro at https://github.com/colomoto/colomoto-docker. The image currently includes GINsim, BioLQM, Pint, MaBoSS, NuSMV and NuSMV-ARCTL. More to come soon. The image also ships the Jupyter notebook. Demos and examples will be produced in the coming months. The docker image colomoto/colomoto-docker is available at https://hub.docker.com/r/colomoto/colomoto-docker. It is automatically built from the github repository. A documentation on how to include and maintain new tools will be added soon. Future directions include the integration of systematic tests to ensure image consistency (test workflows / scripts). Céline wrote a SnakeMake workflow using the docker image and a preliminary sketch of Jupyter notebook, accessible at https://github.com/colomoto/colomoto-docker/tree/master/usecases. Jupyter is an interactive web interface allowing to write notebooks combining code (python or R functions) and structured text for documentations. See http://nbviewer.jupyter.org/github/pauleve/pint/blob/master/notebook/quick-tutorial.ipynb for an example of notebook using GINsim and Pint. A notebook consists in a single file that can shared and re-executed. 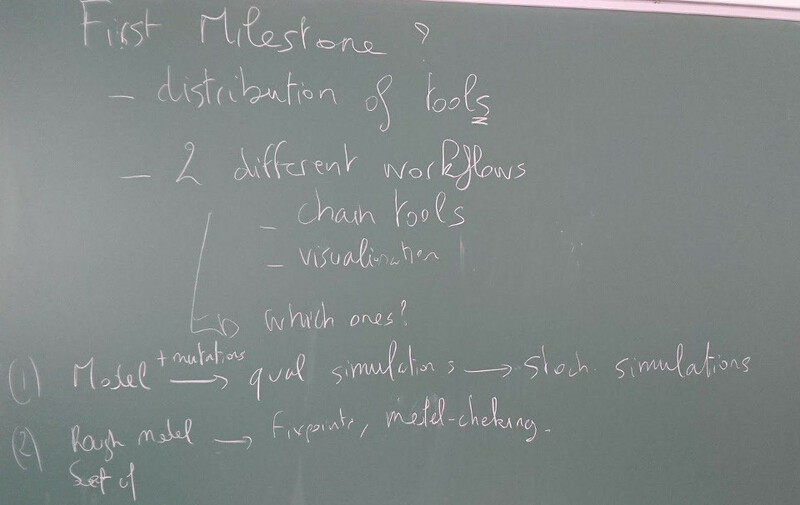 Ultimately, one should be able to write a complete model workflow analysis in a single notebook, showing explicitly the full pipeline of tools and analysis parameters. Although Python is the standard environment for Jupyter, a notebook can combine commands of different languages, including R.
Collectively, we aim to provide Python API for the tools shipped in the CoLoMoTo docker. Writing a Python API for tools requires limited effort, as it may simply call the commands in the background with the appropriate parameters. The main work consists typically in returning python objects for the results, which enables further treatments of the results with other tools (through the python API), or with a standard library, for instance for data analysis and visualisation (e.g. using scipy, pandas, or matplotlib, just to name a few). A typical workflow will often include a “manual” modification of a model, for instance, edge/node addition/removal. We could design an API to ease such modifications, e.g. through a dedicated python module to manipulate Boolean/multi-valued networks, or through some extension of the BioLQM script interface. Other model manipulation to be considered include model merging, the handling of compartments, the integration of multicellular EpiLog grammar. These points would deserve further discussion. Proposed action: organize a 2-3 days hackathon with developers of CoLoMoTo tools to define and implement python interfaces, ideally still in 2017. Loïc will send a message to the mailing to start preparing it. Inspiration: SBML-qual paper, Curie workflow (Arnau Montagud), PNAS paper (Samuel Collombet). 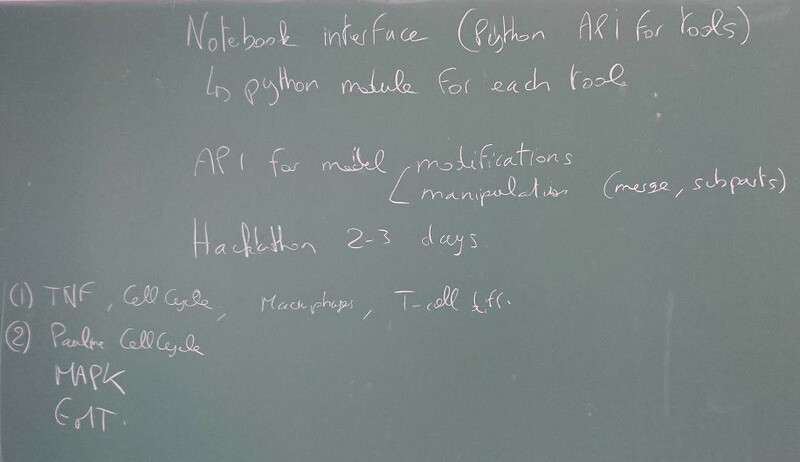 The question of the usage of Docker and Jupyter notebook in a teaching class environment has been raised by Denis. Requiring students to install docker and pull the image (which may weigh several hundreds of megabytes) does not seem tractable. However, one could rely on cloud infrastructures supporting Docker to provide an easy access to the tools: the student would simply have to connect to a given URL in order to write workflows through the Jupyter web interface. 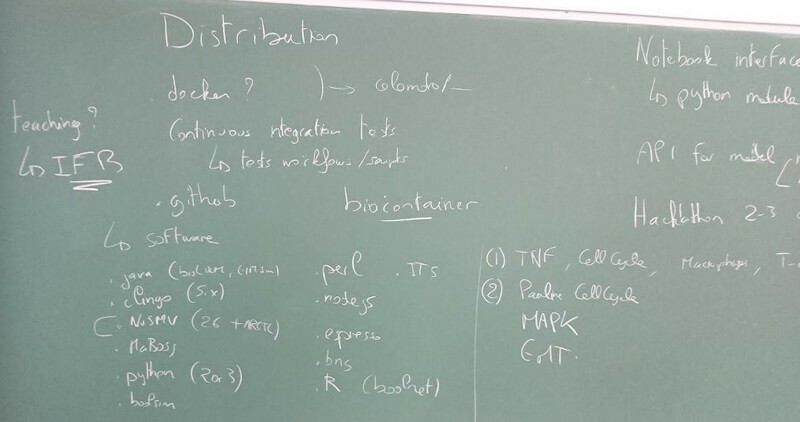 In France, IFB can deploy Docker images and provide resources and access to students (this has been done already for courses using Jupyter notebook for bioinformatic tutorials). A paper for promoting the docker and the Jupyter notebook to ease the writing and sharing of computational systems biology workflows could be sent to Frontiers Research Topic on Logical Modeling of Cellular Processes: From Software Development to Network Dynamics (abstract 1st September, submission 1st February). The paper may show an instantiation of the docker and Jupyter notebook on two workflows. Test suite: We need to contribute with a test suite for SBML-qual (see http://sbml.org/Software/SBML_Test_Suite). This would fulfil the need for a service validating the correctness of interpretation of SBML-qual files. Support of Layout package: F. Bergmann (contact for the SBML-layout package) will be contacted to ask for the support of SBML-qual (i.e. QualitativeSpecies as a minimal requirement, we need to check what is needed for the interactions). support for probabilities associated with the transitions (on top of the previous point? ), to cover Probabilistic models à la Shmulevich. A number of other possible extensions were discussed, but it was agreed to postpone their consideration. Identification of stable states or trap spaces (independent of the updating scheme). Identification of attractors (dependent of the updating scheme, as cyclic attractors). temporal properties (LTL and CTL). Probabilities associated with initial states. Definition of the behaviour of input components: e.g. (range of) probabilities associated with their values, switching values under specific conditions (see point 3.b), etc. Override the ´model modification´as defined in SED-ML or not? The point is that it would be more convenient to rely on a simpler description of model perturbation: block the value of a node within an interval, block the value of a regulatory within an interval. Apply model perturbations at a given simulation step (this is applicable for specific simulation settings such as synchronous or random asynchronous). Make model perturbations stochastic, by associating a probability. In general, would it be possible to switch simulation parameters when reaching a state compliant with a certain condition (see point 3.b), or at a given step? For (part of) these settings, we may need to add new terms to the KISAO ontology, check if there is the notion of exact and estimated results, as some setting should lead always to the same specific results, other not (stochastic simulations). Individual models have already been developed and validated. They can be found in the repository of GINsim, in CellCollective, and to a certain extent in BioModels. These individual models can be seen as modules of “cell cycle”, “apoptosis”, “DNA repair”, etc. The question is: when creating a new model, could we use existing models and, if so, how to assemble them? intercellular: different cell types interacting, or a population of interacting cells of the same type. how to preserve layout, which constitutes an important piece of information when constructing a regulatory network. We are aware that a software tool to compose models cannot fully automate the merging, but it should ease merging and suggest options for pending issues. We could get some inspiration from the SBML-comp package to define the rules for composing two models. To ensure the construction of comprehensive regulatory graph, when merging two models, we could test using OmniPath that all the connections between the nodes, that are found in other databases, are added to the composed model and annotated with publications. remember the modeller’s decision to formally define a merging strategy: keep track of all decisions to be able to come back to these rules if something does not fit in the model, or allow to change the rules for which the modeller was not confident at first when checking the sensitivity of the model. Note that EpiLog has a grammar for simple integration functions, which could be extended to cope for more complex cases. Discussion moderated by Gautier Stoll. TCR (alpha+beta+) T cell selection. spatial distribution; to keep the logical modeling philosophy, spatial effects could be modeled within discrete compartments. One question arises: are these “phenotypes” really specific to the immune system? The answer is no, as each of them could be found in other biological processes. But it remains interesting to regroup immune system models, at least because modelers may have specific problems/results to share.